Below is the biography of George William Whitaker, an American landscape artist who was known for co-founding the Providence Art Club in the late eighteenth century. George William Whitaker was born in Massachusetts, the United States on 25th September in the year 1840. His father was an Englishman who was brought to the United States as a child. His name was James Whitaker and mother’s name was Elisabeth Whitaker who died at an early age. George was left an orphan at the age of 2. He was raised in Rhode Island by his grandparents. His artistic skills came to be seen right since he was a child. He was sent to New Jersey to study art under Professor Guillebeau. He lived in a utopian socialist commune. Then he worked with his uncle New York city as an engraver. The art of engraving had gained considerable popularity among New Yorkers in the early 19th century. While working as an engraver in New York, George became interested in painting. 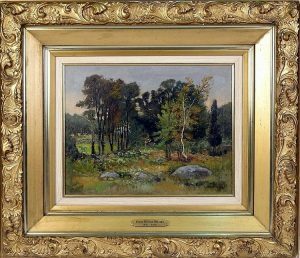 The love for painting led him to join the Hudson River School. 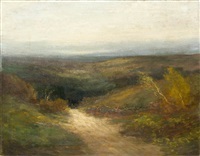 He learned art under American landscape artist – George Inness and Alexander Wyant in New York. He was highly influenced by the European art culture and studied their paintings deeply. He was also very interested in the Barbizon School, a movement of artists in France. 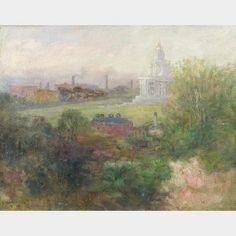 He founded the Providence Watercolour Club and was one of the founding members of the Providence Art Club in Providence, Rhode Island. He shared a studio with Sydney Burleigh In Fleur De Lys Studios. Sydney was an American artist known particularly for his oil paintings. He was also an art critique in the AE Society that he organised and founded for professional painters. 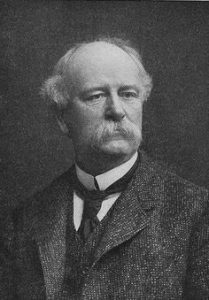 He also helped in the foundation of Rhode Island School of Design and became an active professor in the school. 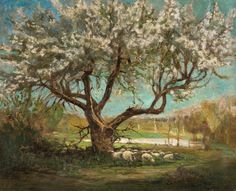 His specialisation in landscape painting was his depiction of nature in various colours of the atmosphere. In 1867, he exhibited at the National Academy and then again in 1869. 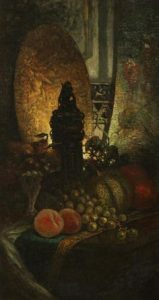 He also exhibited at the Boston Art Club in the late 18th century. His artwork still appears in the Rhode Island School of Design, the Providence Art Club and some also appear in the Michigan State University. All his life he remained a Democrat. He was elected for office many times as State Senate but unfortunately, he never won. He was a regular volunteer at the Fire Department of Providence and also at the Park Fund. George married Sarah Hull, the daughter of the Sherman of the city of Providence. They lived in Fruit Hill, North of Providence and were both actively involved in the betterment of the neighbourhood. They were also active members of the Church and were involved in many church activities. Together, they had a daughter who they named ‘Elisabeth’ after George’s mother. George William Whitaker died on the 6th of March 1916 at Providence, Rhode Island – a place where he spent most of his life. He is buried at the Swan Point Cemetery in Providence. He is remembered for his accurate depiction of nature and atmosphere in a manner which is poetic and with a flow.